General view of dun from the south. Publication drawing; plan of dun and outworks. Photographic copy. 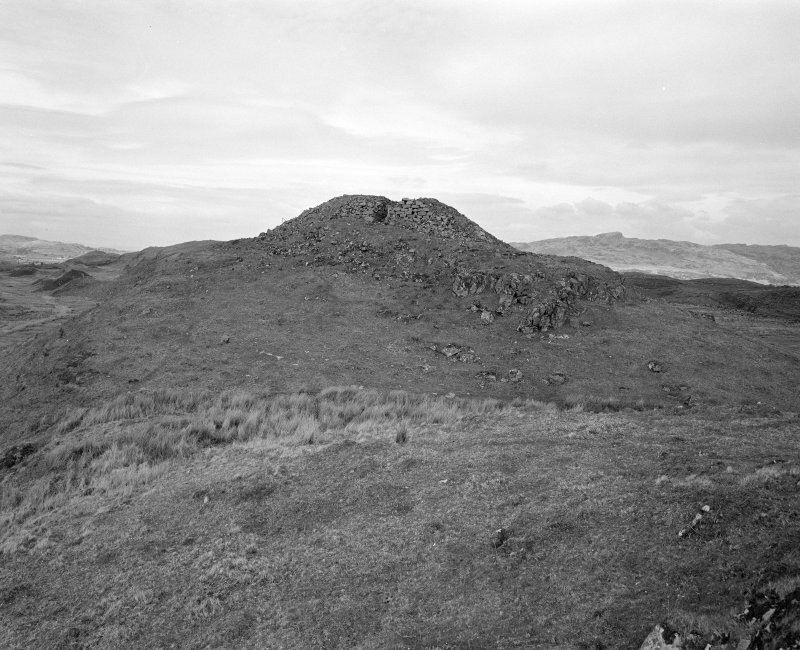 The impressive dun of Leccamore stands within outworks on the highest part of the easternmost of the dorsal ridges of Luing. 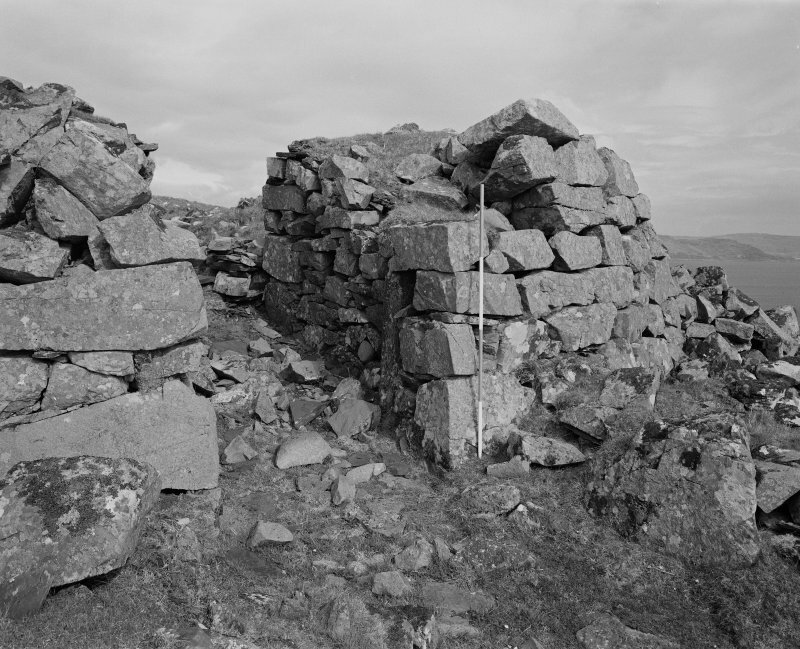 The dun was partially excavated by Macnaugton in 1890 (1891) and 1892 (Macnaughton 1893). It measures 19.8 by 12.8 metres within a wall 4.0 metres to 4.9 metres thick, and has an entrance in the SW and another in the NE. Long stretches of both faces of the wall are visible throughout the circuit and at the south end where it is best preserved, the outer face stands to a height of 3 metres in eight well-laid courses. The SW entrance measures 1.7 metres in width externally, and to provide checking for a door, two jamb stones have been built about 1.2 metres inside the outer corners of the passage. 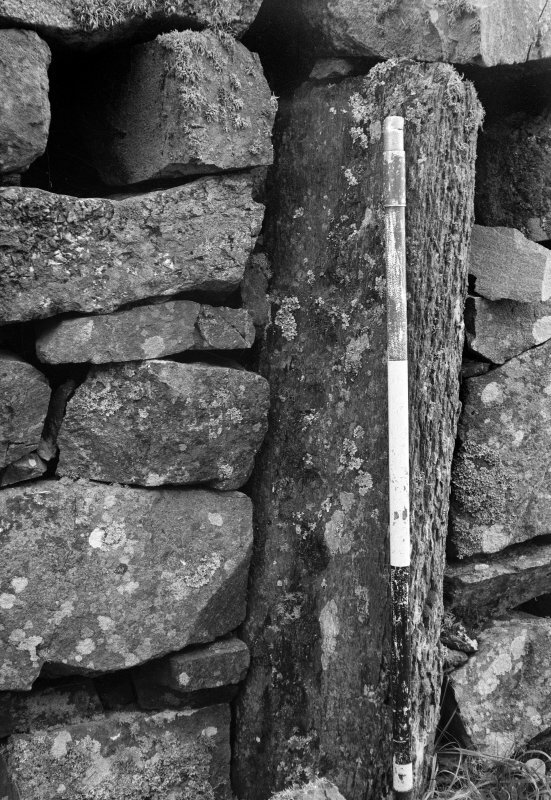 The south jamb measures 1.32 metres in height, 0.43 metres in width and about 0.23 metres in thickness. 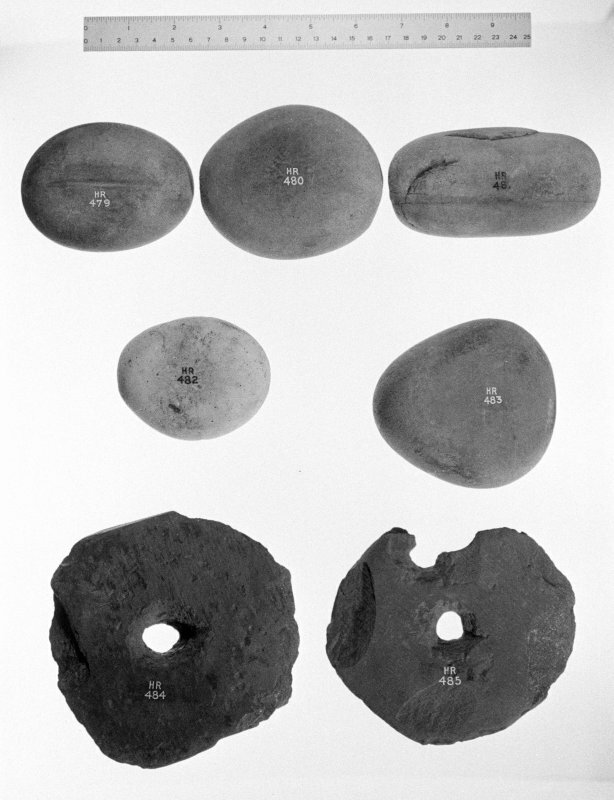 The inner face of this stone has at least fifteen cup-marks pecked into it, ranging from 38mm to 76mm in diameter and between 13 and 25mm in depth. The north jamb is of a similar size to the one on the south. 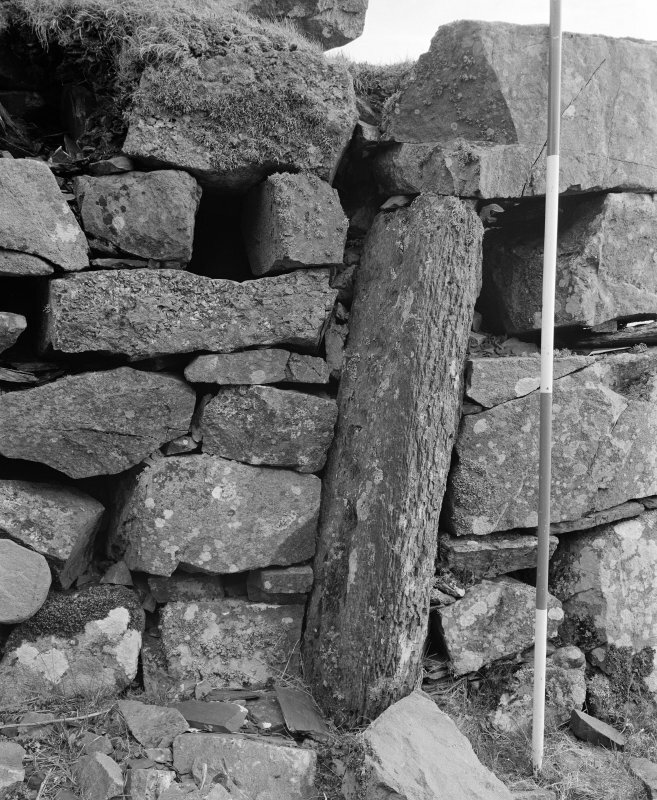 There is a bar hole 0.9 metres in depth on the north side of the passage, and on the south side there is a complementary slot for storing the bar, extending 2.7 metres into the thickness of the wall. The entrance passage, which was originally paved, is 4.3 metres in length, and the walls now stand to a height of 1.8 metres. 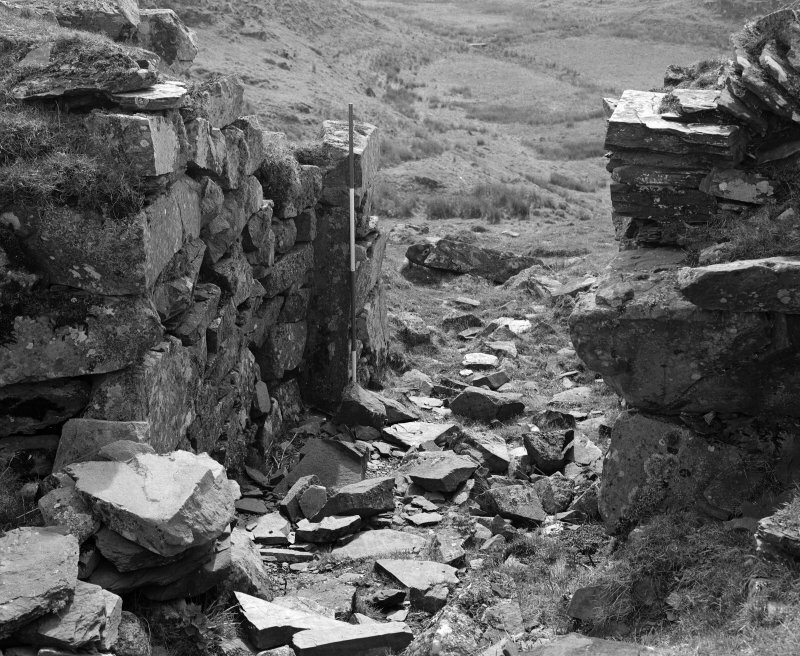 The lintel over the door and some of the roof slabs of the passage had been removed only a short time before the excavation of 1890. The NE entrance has a uniform width of 1.5 metres. There is no trace of door checks, but these may have been removed when the outer corners of the passage were destroyed. 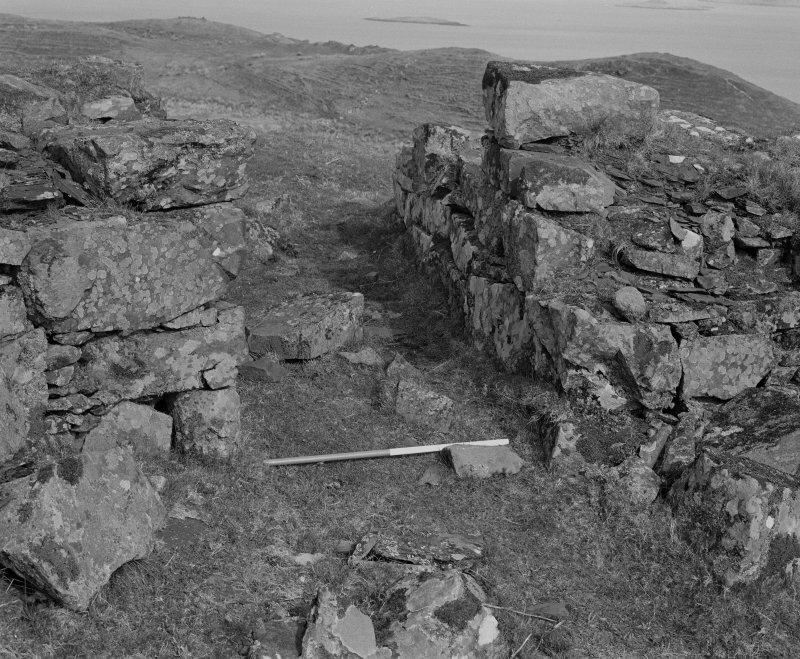 On the south side of the passage are the remains of a straight-sided chamber extending into the wall for a distance of 1.2 metres. 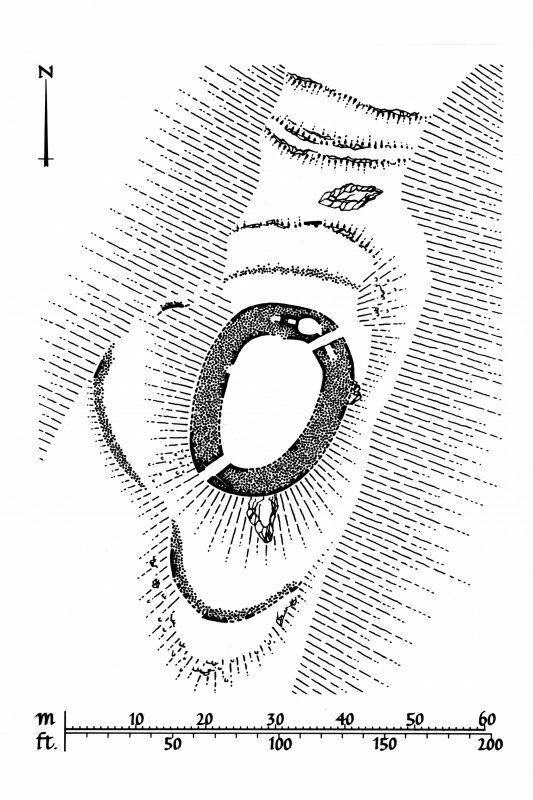 On the north side, there is an oval guard chamber which is entered up a step and along a narrow passage. This chamber measures 2.7 by 2.4 metres and its walls stands to a height of 1.4 metres above the debris covering the floor of the chamber. 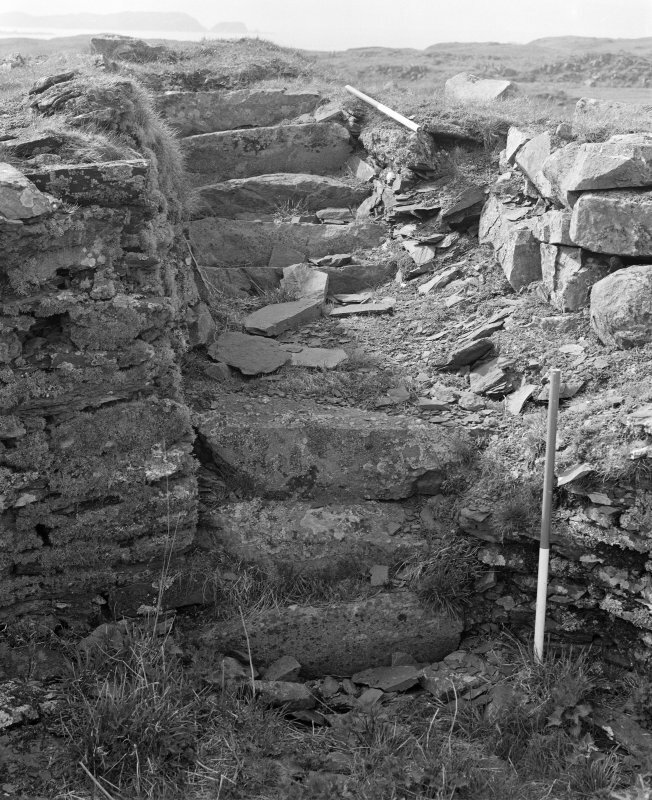 A flight of steps leads from the chamber to the wall-head. 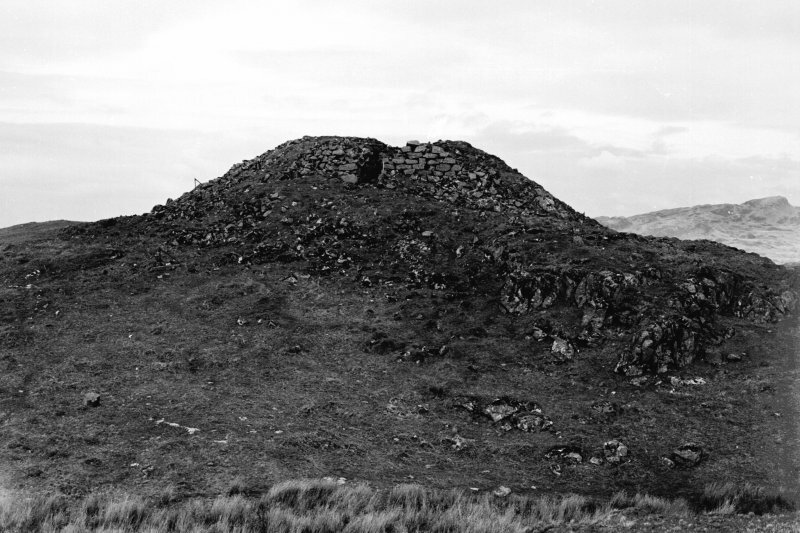 The foundations of walled enclosures within the dun are clearly secondary. The steep, grassy flanks of the ridge give natural protection for the dun on the east, but additional defences have been provided on the other three sides. 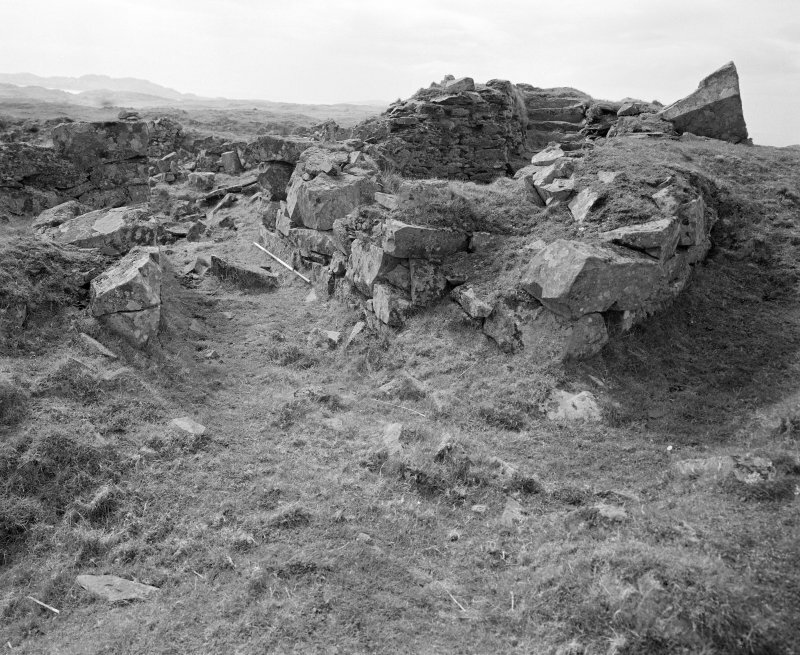 On the north, are two rock-cut ditches measuring 1.8 and 3 metres in depth respectively, while on the north, west and south there is an outer wall which largely follows the natural crest line. 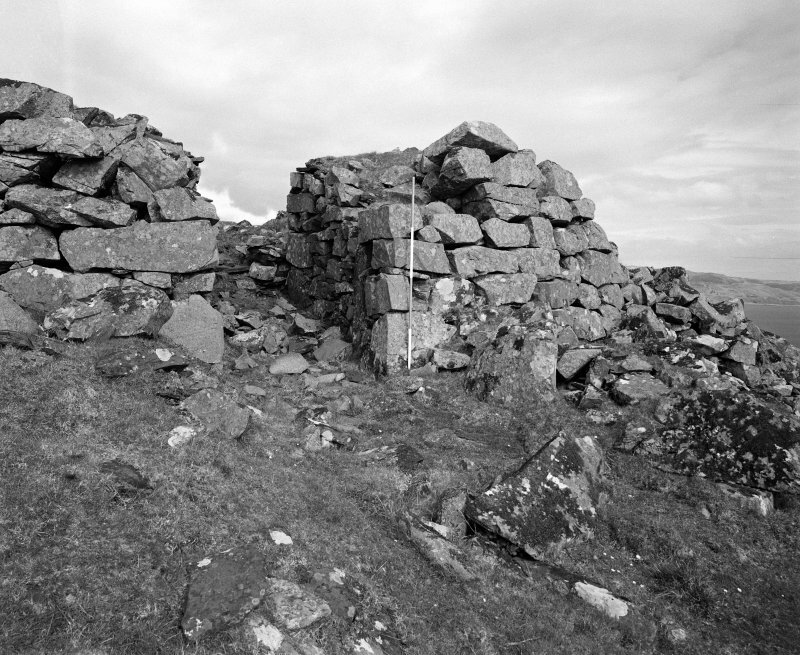 Considerable stretches of the outer face survive on the south and there are shorter stretches of outer and inner facing stones on the west and NW, but elsewhere the wall is reduced to a band of rubble. 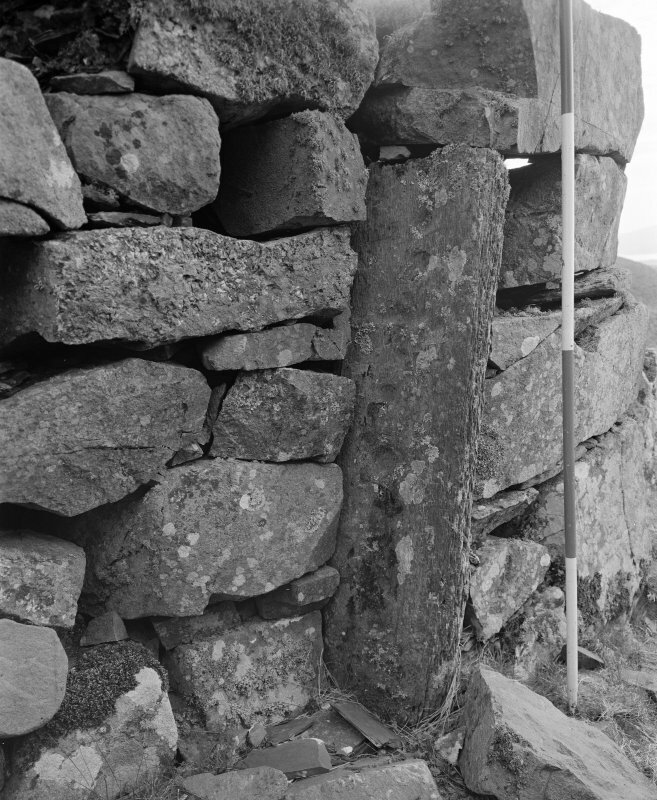 On the SW, a gap in line with the dun entrance probably indicates the site of a gateway. 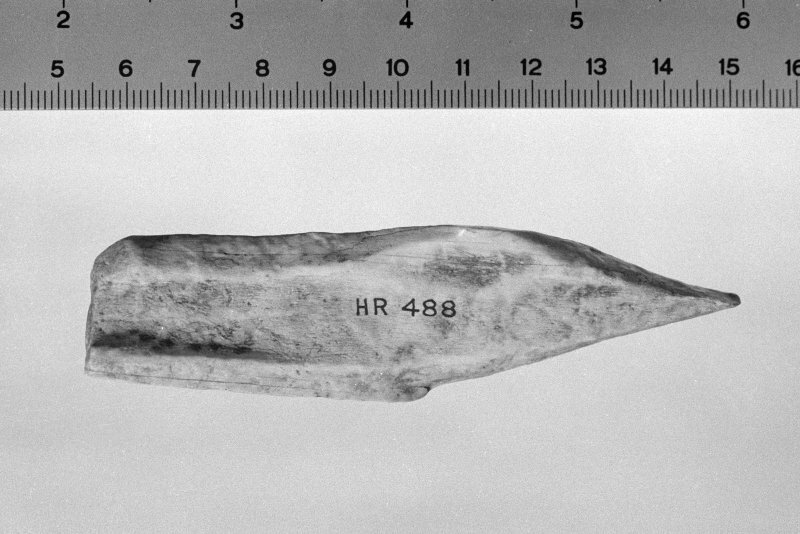 Finds from the excavations included stone implements, a bronze stem, a fragment of an iron blade, two bone points and a piece of worked antler, as well as a quantity of animal bones and shells. Most of the finds are in the National Museum of Antiquities of Scotland (NMAS). 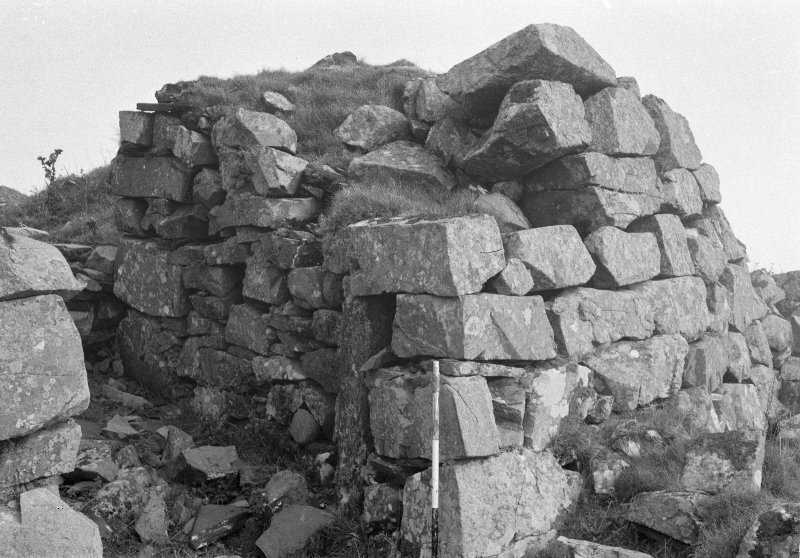 A Macnaughton 1891; A Macnaughton 1893; RCAHMS 1975, visited May 1966. 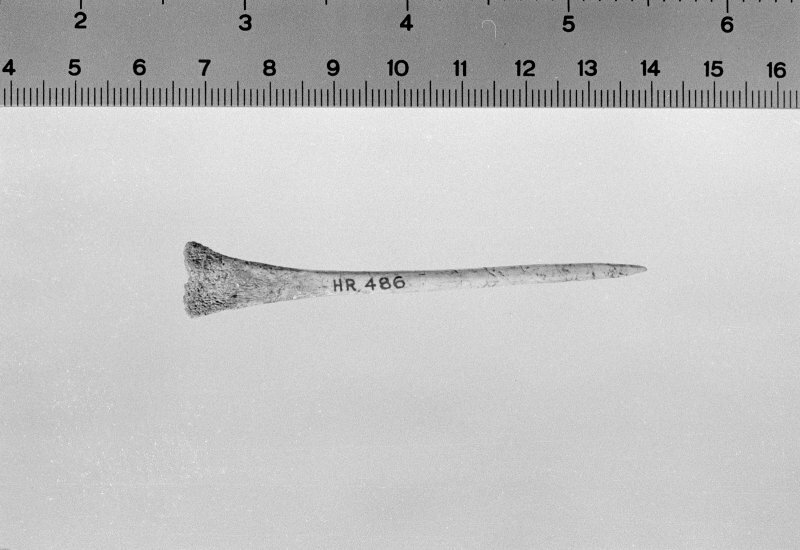 Visited by OS (DWR) 14 September 1971. 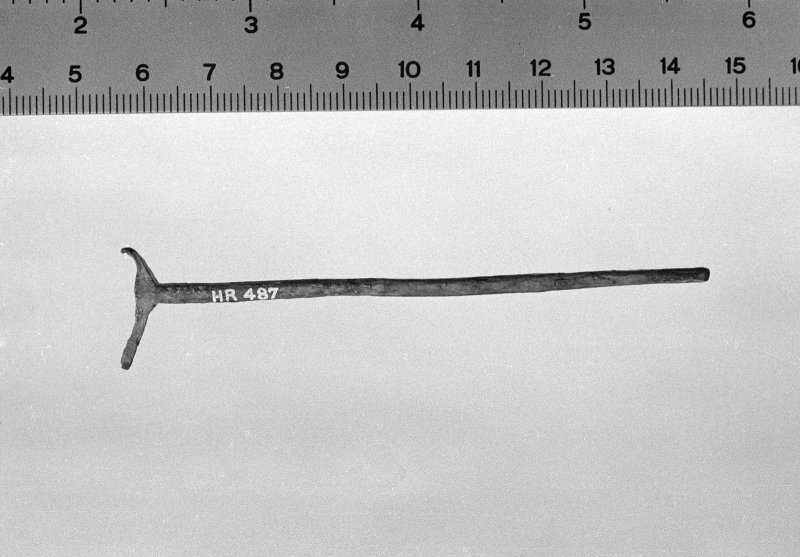 This dun is both remarkably well preserved and also contains several unusual features. 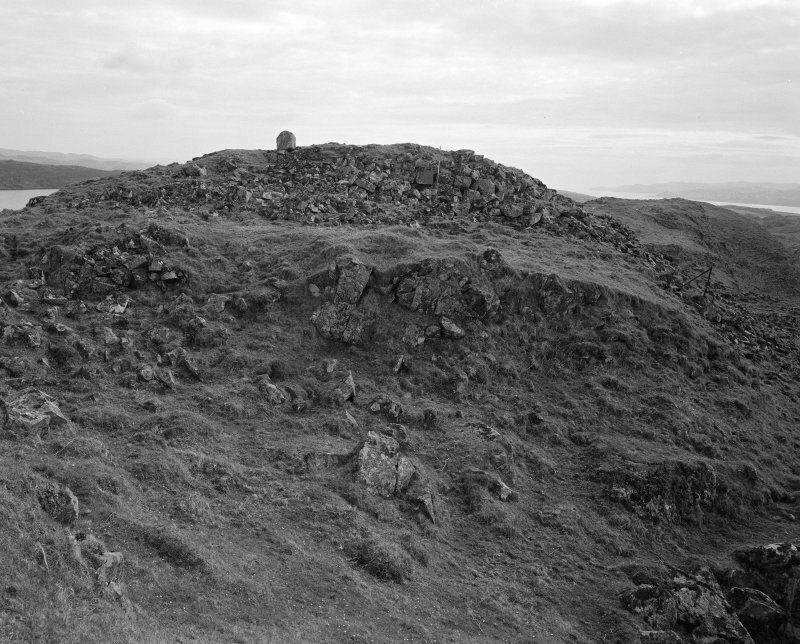 Situated on the summit of a long ridge, it has been defended both by an outer wall and on the north by two rock-cut ditches which run athwart the ridge. 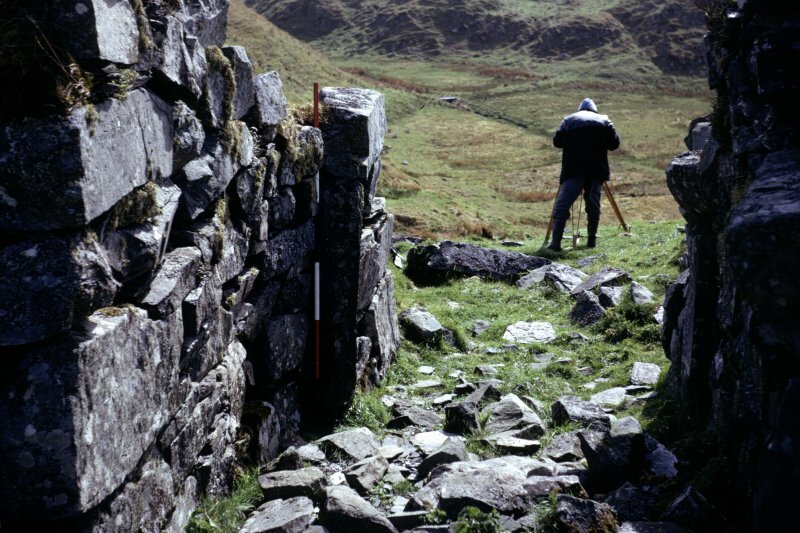 The dun measures about 20m by 13m within a wall which is up to 5m in thickness. The dun has two apparently contemporary entrances, one on the south-west and the other on the north-east side. The outer wall-face on the south-west has been particularly carefully constructed with a distinct batter, and the walls of the entrance passage still stand to a height of almost 2m. 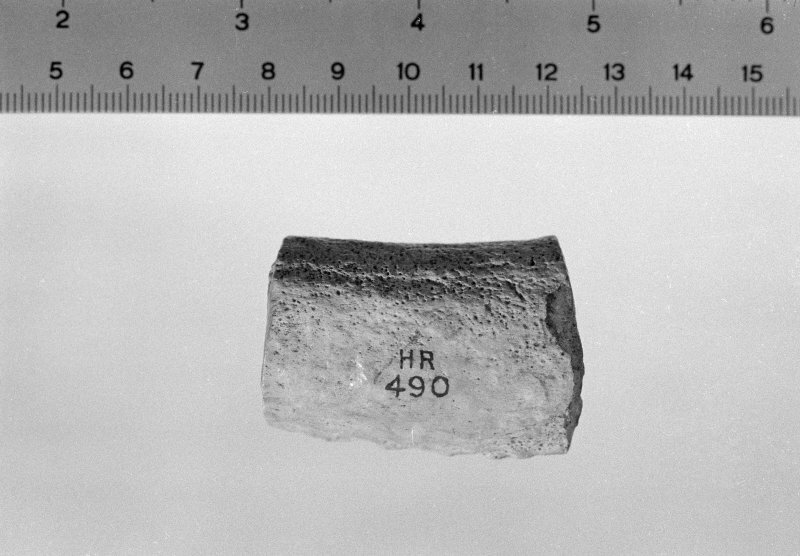 The passage has door jambs close to the outside, one of the jamb-stones bearing at least fifteen cup-markings on one face; perhaps the stone was one slab of a cist burial discovered in the course of the original building work. The bar-hole and the opposing slot for storing the bar when the door was open are still visible, the slot extending for a distance of 2.7m into the thickness of the wall. 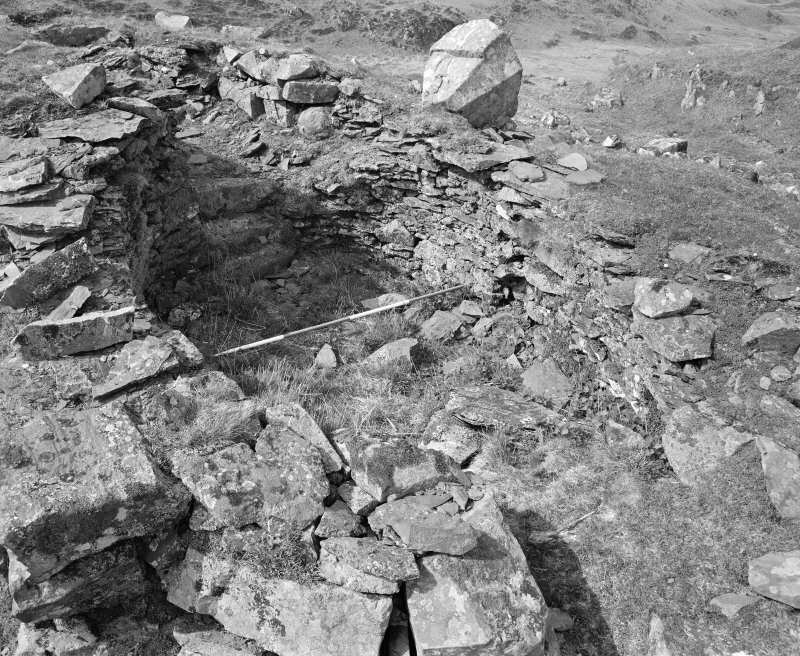 The north-east entrance is less well preserved, but there are cells on both sides of the passage, that on the north-west side being carefully corbelled. Leading from the west side of this cell there is a flight of steps, which presumably allowed easy access to the wallhead in times of attack. 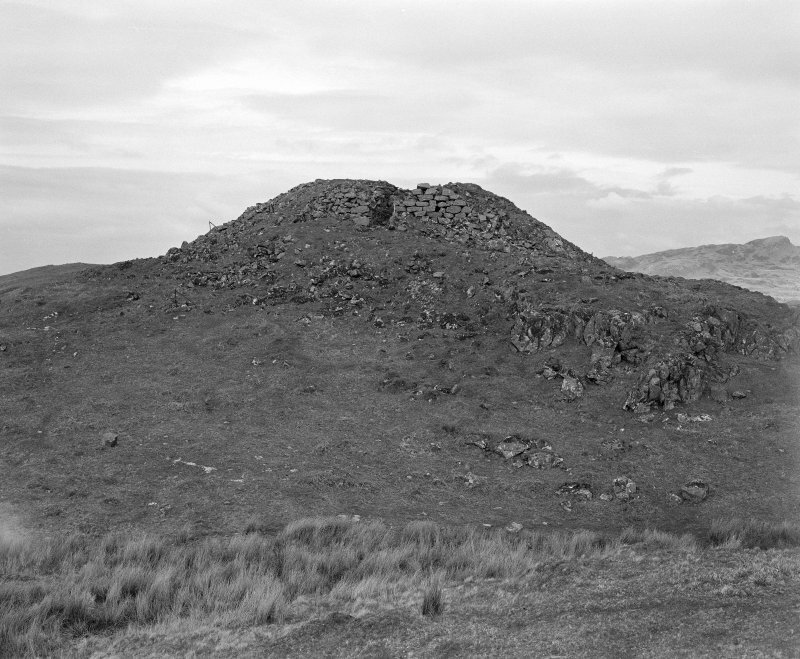 The spectacularly well-preserved dun on the summit of this ridge stands within a larger enclosure defended by a wall set lower down the slope. 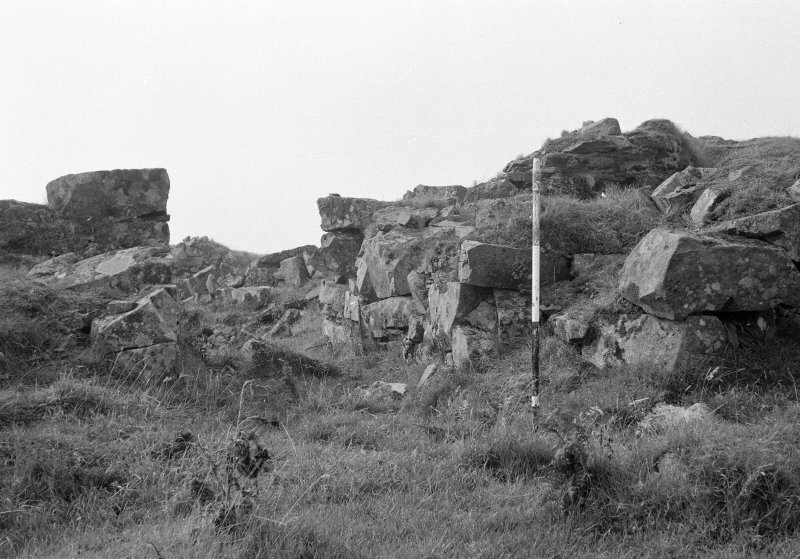 Irregular on plan, this enclosure measures about 50m from N to S by up to 40m transversely (0.13ha) within the wall, which is largely reduced to a band of rubble with a few runs of outer facing-stones on the S and W; a gap on the SW probably marks the entrance. 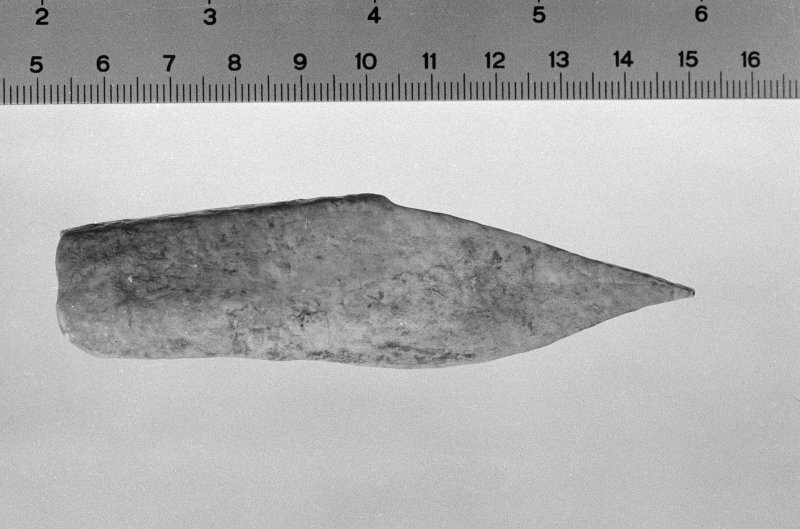 On the N traces of a second wall can be seen on the inner lip of a ditch some 3m in depth, which, along with a second ditch 1.8m in depth, cuts across the spine of the ridge on this side. 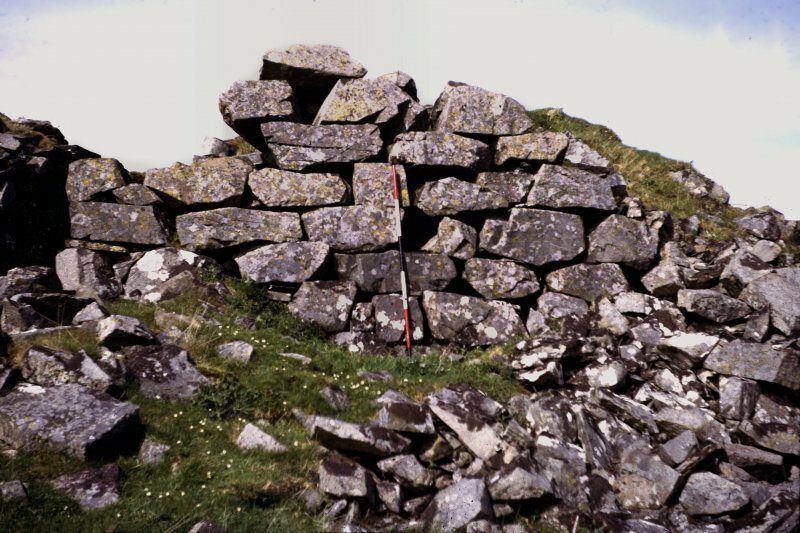 The dun itself measures about 20m from NNE to SSW by 13m transversely within a wall between 4m and 4.9m in thickness and still standing in some places up to 3m in height. 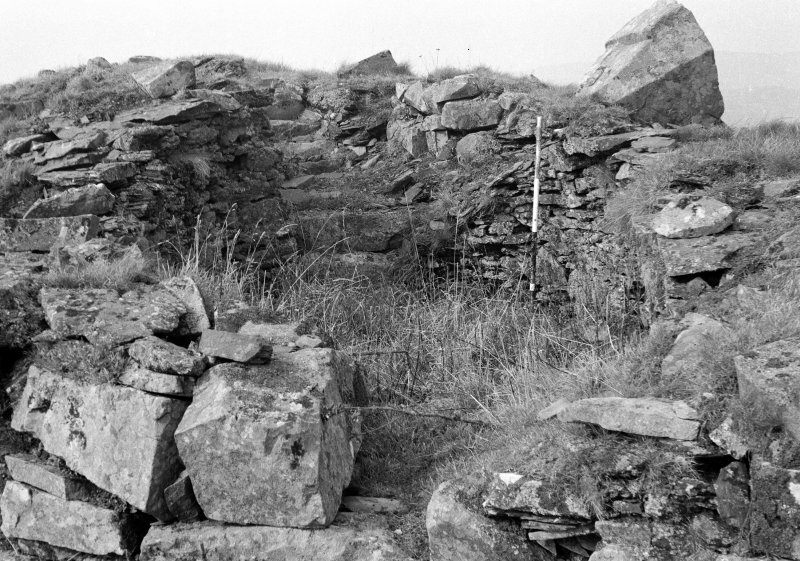 One entrance with checks and a bar-hole lies on the SW, while a second with chambers to either side, that on the W leading to a mural stair, is on the NE. 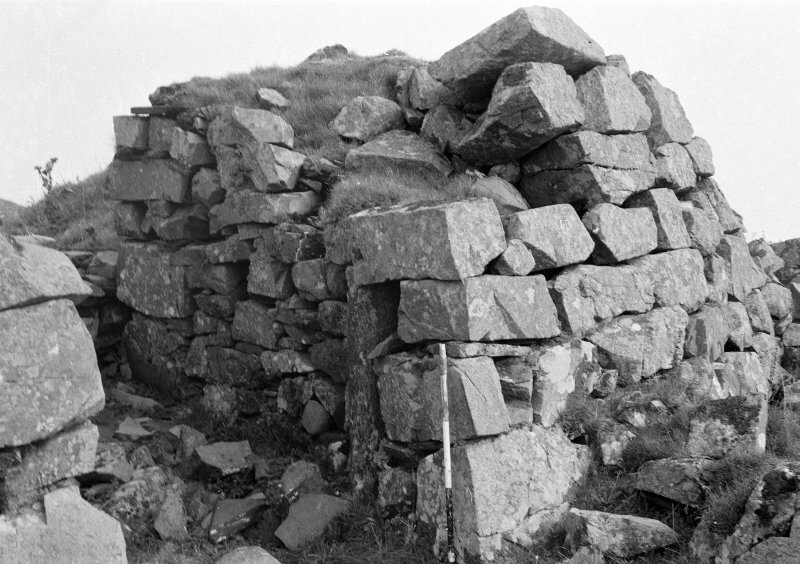 Excavations were carried out by Allan Macnaughton at the dun in 1890 and 1892.